Before there was rock and roll, there was country. And believe it or not, you can play country on the piano or keyboard. This style often sounds relaxed, lyrical, simple, and grassroots-ish, but it ain’t afraid to rock, roll, and rumble. Artists like Keith Urban, Carrie Underwood, Shania Twain, and Brad Paisley put all kinds of musical influences in their country music, including elements of rock, blues, and even jazz. Influences aside, though, the folks in Nashville still call it country. This example is a nice, relaxed-sounding slice of the country music style. 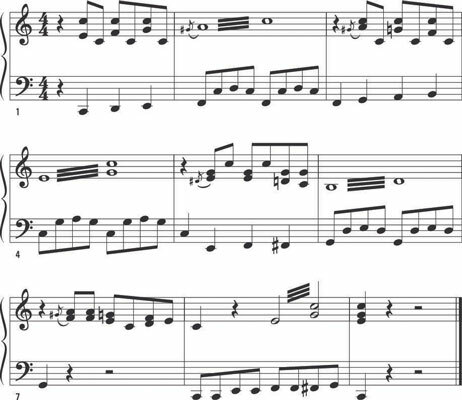 The right-hand intervals are unique in that the melody notes are actually on the bottom while the top notes stay the same. Grace notes and tremolos peppered throughout give this example the feeling of an Old West saloon. The left-hand accompaniment pattern is challenging, so practice each hand separately until you can confidently put them together. After this inspiring tune, you may find yourself adding a saddlebag to your piano bench.